Lemon Rasam generally prepared using toor dhal and tomatoes. My easy to make version is so easy and is normally ready in minutes. At home everyone likes this version than the original version.This rasam comes in handy when you are running out of time. Especially if you have prepared a nutritious Stir fry/ Porial/ Thoran/Kootu, this is the best easy to prepare curry combination. Grind garlic, jeera, pepper, coriander seeds as a coarse powder. Heat oil in a pan and splutter the mustard seeds; add fenugreek seeds and fry till golden colour. Add curry leaves and asafetida. Add the ground powder and fry in the same oil for fifteen seconds. Add turmeric powder; immediately add 2-3 cups of water and salt. Sprinkle some chopped coriander leaves.Cook the rasam in low flame till you get the frothy stage on top of rasam. Put off the gas and squeeze the lemon juice. Mix well and serve. Check the salt and add if you require more. 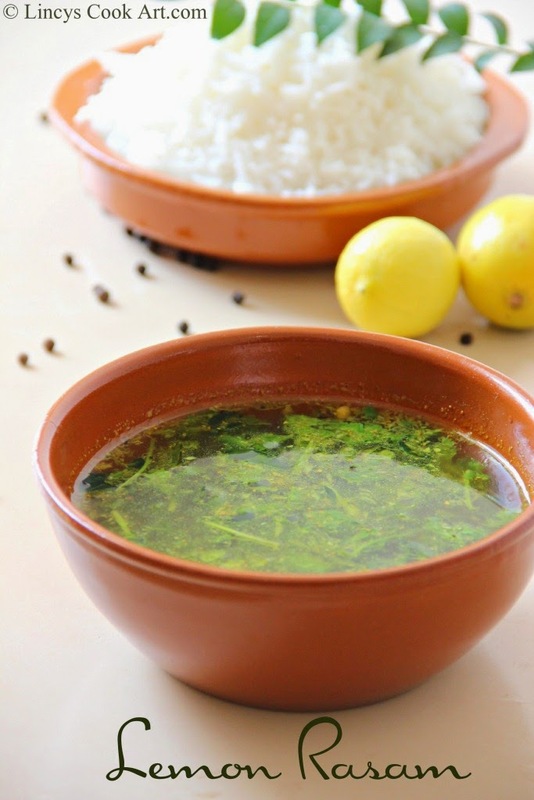 Yummy rasam ready in just under 5 minutes. Dont allow the rasam to boil. The taste may turn bitter. Looks very comforting and delicious dear ...yumm !! Lovely lemonly flavors, u mean juice of two lemons right? Will try this for sure. How I wish I would have bought lemons yesterday. We simply love any kind of rasam. Never mine, will try for next weekend. Really without toordal and tomatoes..a quick way to make. I can survive for many days with this rasam, serve me with some rice can have it even everyday.